Prototype: German Federal Railroad (DB) class VT 98.9 rail bus motor car and class VS 98 rail bus control car. In original crimson paint scheme. Motor car road number VT 98 9705, control car road number VS 98 306. The cars look as they did at the start of the Sixties. Model: The motor car has an mfx+ digital decoder and extensive sound and light functions. It also has controlled high-efficiency propulsion. 2 axles powered. Traction tires. The motor car has factory-installed interior lighting. The rail bus has triple headlights and dual red marker lights that change over with the direction of travel, will work in conventional operation, and can be controlled digitally. The headlights at both ends of the motor car can be turned off separately. The control car has factory-installed interior lighting. The control end of the car has triple headlights and dual red marker lights that change over with the direction of travel. The rail bus units have a current-conducting drawbar coupling with a guide mechanism between them. Brake hoses and a current-conducting drawbar coupling are included. Maintenance-free warm white and red LEDs are used for the lighting. The engineer's stands and the car's interior on both cars as well as on the optionally available trailer car allow an open view through the windows. Length over the buffers of the two-part set 32.2 cm / 12-11/16". 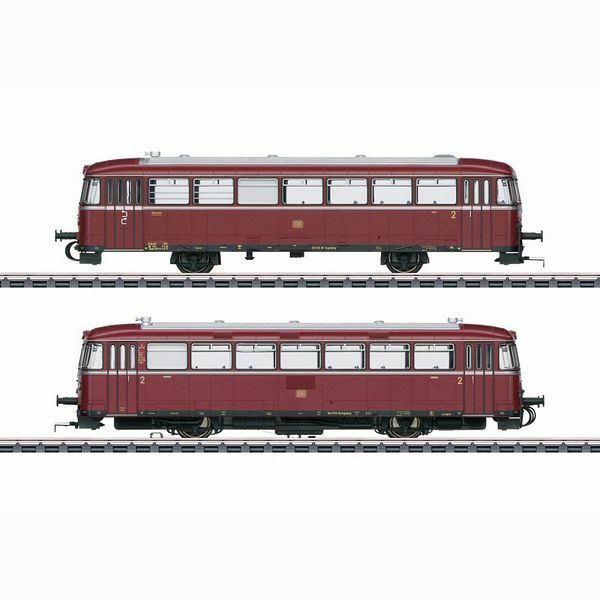 The VB 98 rail bus trailer car to add to this two-part set consisting of a motor and a control car is available under item number 41988. Car body chiefly made of metal.